Drawing (Dhaanto "Dance") by Hassan Nor, Minneapolis artist. After I had the good fortune to meet Hassan Nor, through his daughter, I facilitated for the elder artist, born in 1936, to exhibit his drawings in several venues, including the Minneapolis Institute of Arts (Mia) in 2017. The exhibit, I am Somali" culminated from two years of meetings with the artist and the assistance of four interpreters. 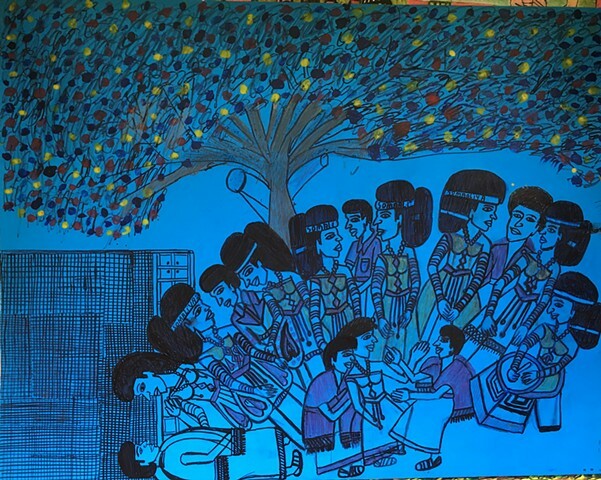 Adeer Nor's drawings depict his memories of life in Kismayo, Somalia, when he was young. When I had the opportunity to meet Mia's curator of African art, Jan-Lodewijk Grootaers, I advocated for a museum exhibition of Nor's work. Assisted by artist, friend and interpreter, Halwa Hussein, we brought Adeer Nor's work to a large audience in the first show of Somali art in a Minneapolis museum.